A BUBBLING CAULDRON: Jess Is Back! 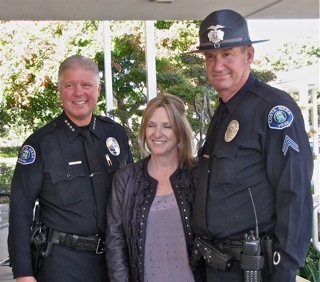 In a press release late this afternoon the City of Costa Mesa announced the return of recently-retired Costa Mesa Police Officer Jess Gilman, who will work as a Reserve Officer and School Resource Officer on a part-time basis. You can read the information from the City web site, HERE. This is terrific news since, starting Monday, Gilman will work on both Costa Mesa high school campuses as part of a larger response to the recent tragedy in Newtown, Connecticut. Costa Mesa Police Chief Tom Gazsi is quoted as saying, "While school security remains the responsibility of the District, the City will continue to support these endeavors in a collaborative, aggressive and proactive way." The press release also indicated that The City of Costa Mesa expects to hire four police officers by mid-January and will add additional full time and reserve officers shortly thereafter. This is great news for us all. Congratulations to Chief Gazsi, CEO Tom Hatch and Newport Mesa Unified School District Superintendent Dr. Fred Navarro for aggressively addressing this issue. with him on duty there! I think this is all great! And, for Costa Mesa, a positive way to start the new year! Let's hope this is the beginning of a new trend!! This is wonderful news, Welcome back Officer G! Jess has saved lives. Over time a new team can forge the trust and relationships he has nurtured for 2 generations, but right now no one has earned the confidence of the kids the way he has. This is crime prevention at it’s most basic, and it’s a big relief to have him back as an SRO. Geoff, thanks again for your take on local affairs and analysis of the upcoming agenda. Now I can plagiarize freely (with attribution and a link of course) as I send out updates to the CM4RG email list! Seriously, you provide a consistent service to Costa Mesa. I love how you inform, entertain and opine in amusingly illustrated regular doses. The return of Officer Gilman plus the hiring of more officers is excellent news indeed! Perhaps someone wants to get "promoted" to County Supervisor and sees the benefits of leaving CM in good shape. Are you excluding Leece and Genis? Exactly, History Channel! An intentioned slight! Even though Robutto will claim (in public anyway) that his use of "councilmen" was meant to a generic term for both the "men" and women of the council. Yeah, right! Way to go council women and men! In spite of what Steve still thinks, it was the councilMEN who voted to get rid of the SROs in the first place. While I think that it is great that the Costa Mesa High Schools are once again protected by a law enforcement officer, I can't help but wonder about what the thoughts are of from the full-time police officers for officer G returning in a reserve capacity? He would seem to be doing exactly what the city council wanted, more reserve officers doing work at a discounted rate. Just curious. The council killed the SRO program by gutting the PD for politically motivated reasons. Heck, Mensinger didn't even realize it, he was so out of touch. Now their supporters applaud them.